This book is a surprise. Douglas Bond is a greatly appreciated author, but what is he doing dabbling in theological issues? Historical fiction yes, but a defence of the gospel seems rather out of his province. Indeed we learn in the foreword that he questioned this himself when the idea for the book was birthed: 'I'm a storyteller, not a theologian. If this book needs writing so much, leave it to the experts.' But that is precisely the dimension that gives this book its usefulness. He has the flair to connect. And he does it on an important subject, which must not be allowed to be caught up into the ivory towers of the 'experts'. The matter of concern is 'law creep'. This is the term describing a subtle activity of the Devil in every generation to pollute the pure doctrine of the gospel. He works to undermine confidence in free grace within the church of Jesus Christ. How is this manifested? When preachers proclaim the 5 Solas of the Reformation, but then call the law in by the back door to disciple the converts. When imputed righteousness is treated as if it were a dangerous concept. When faithfulness to the covenant is a teaching directed at man, not God, and drowns out the call to faith in Christ. Bond demonstrates law creep from church history. He shows that no denomination has been free from its corrupting tendency. Everyone asserts that this is an issue in other churches, or for other families, but not for them. And this is the way law creep spreads - no one sees the beam in their own eye. Bond also presents the results from a tour he has undertaken of a spread of churches. Without mentioning names he supplies and analyses key sermon quotes, acting as a watchdog, vigilant but not scathing. He further engages with the radical language of the Apostle Paul in Romans - if this were not in the Bible would it not be condemned in many churches as unsafe? Free grace = cheap grace = loose living. But this is the conclusion Paul is denying. Grace does not lead to ungodliness, not because of the safeguards of the law, but because of the sanctifying effect of love in the heart. Douglas Bond is definitely not an innovator or a 'new calvinist'. He roots his concerns in Reformation confessions. He is just concerned (as John Newton) that self righteousness can feed upon doctrines as well as upon works. In other words, 'correct' churches can harbour works righteousness as much as those where free will and man's doings are rampant. As a lover of hymns, one very telling point Bond makes is that free will theology cannot be put to music. Isaac Watts could write soaring lyrics concerning the sovereign love of God, but words about the choice of man never get off the ground. In proof, Appendix B contains Bond's humorous attempt at such a hymn. Each chapter closes with discussion questions in true American fashion. Note that this is not a slim book, and one criticism would be that he has spun out his tale too long. But it is easily read (although the issue makes for uncomfortable reflections). 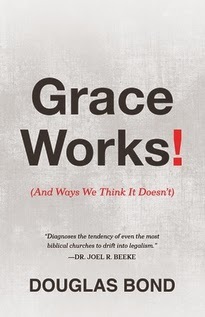 Grace Works! by Douglas Bond, large p/b, published by P & R Publishing 2014. Price £9.99.